A new computer bug has left billions of devices open to cyber attack after researchers discovered a flaw in computer chips manufactured by Intel and other leading companies. This flaw means that devices could be insecure and give up information which makes them vulnerable to hackers. This global issue could leave your sensitive information such as passwords, encryption keys, or personal information open to attack by hackers. Intel are currently working on resolving the issue but it has the potential to impact on your work and personal devices in the meantime. Intel became aware of the two bugs in the computer chips, known as Spectre and Meltdown, in June last year after Google researchers came across the issue. The issue only officially came to light when a security alert was alluded to in a rival company’s email newsletter and it was picked up by journalists who alerted the public. Although Meltdown can easily be fixed through an update, Spectre is proving to be less easily fixed and the tech company continues to work on the problem. Intel provides chips to about 80% of desktop computers and 90% of laptops worldwide and the systems affected include a number of tech giants including Intel, Microsoft, Apple, AMD, Google, ARM and Linux Kernel. The flaw in the chip means that hackers could potentially access all of the files on affected computers, including passwords. Intel and Google have both indicated that they would have disclosed the issue once solutions had been confirmed so hackers wouldn’t take advantage of the situation. Although in this case Intel didn’t tell the public of the issue, it’s interesting to note that many Australia businesses will be subject to the new Notifiable Data Breaches (NDB) Scheme from February 2018. This means that businesses will be obligated to tell customers of data breaches. Intel are currently working on fixing the identified issues with the computer chips through widespread software updates. Although most software will update automatically, make sure you accept software updates which are coming through as this will protect your computer’s information from cyber attack. To ensure the best security possible, make sure your operating systems, anti-virus software, browsers, web plugins and any other applications are updated. Check to see if your computer has the option of automatic updates and enable this so software updates can filter through as they become available. Although you (hopefully!) 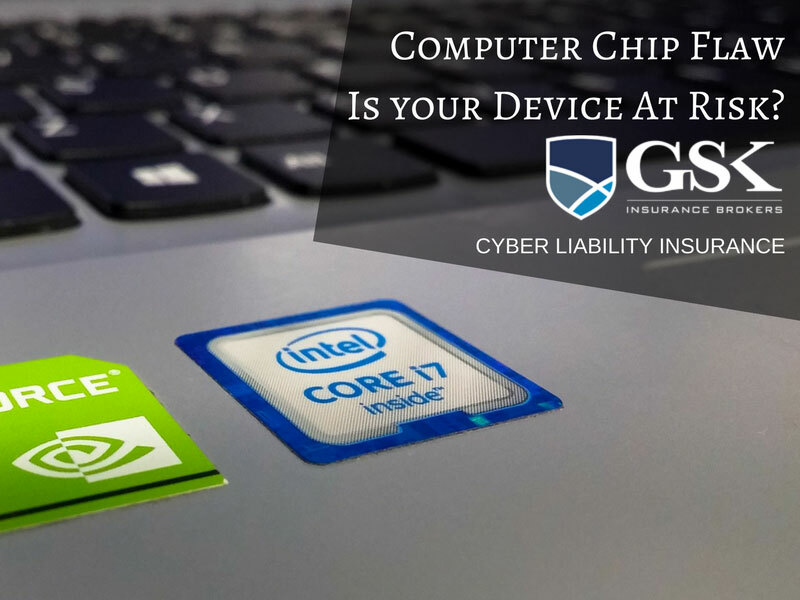 never have to deal with an issue to the same scale as Intel, if you work in the information technology industry this news comes as a timely reminder to make sure you have the necessary cyber liability insurance in place. GSK Insurance Brokers offer cyber liability insurance Australia, along with a number of other policies which apply to individuals working in the IT world. When it comes to cyber liability insurance coverage, our brokers keep an eye on the ever-changing digital landscape and take into account any changes which may impact on your risk for comprehensive cover. Need more info? Contact one of our brokers today. For cyber liability insurance coverage, speak to the team at GSK Insurance Brokers today on 1300 687 962.